Metal clay is a mix of a binder and fine metal particles, which when mixed with water takes on a clay form due to the binder. In it's clay form it can be shaped and textured, just like Plasticine or regular clay. This makes it very versatile to use. Jewellery, small sculptural items, or accessories can be made relatively easily, and without necessarily having to buy expensive jewellery smithing tools, which you might need if you were to use the regular form of the metal. Inclusions can be used, such as gemstones and jewellery findings, dependent on the firing temperatures required. Next the clay is dried, and once dry it is heated, usually in a kiln, so that the binder burns off and the metal particles bond together ('sinters'), forming a solid piece of metal. Other mediums can be used with the finished metal, just as you might with in normal jewellery smithing, such as enamelling. Silver metal clay is popular but expensive. A small amount of 7g (enough for just a very small pendant) can cost from around £16.00 to over £100.00 for 50g. The end product after firing is real silver. With the current gold rates it is extremely expensive, costing over £200 for a tiny amount of 3g. The end product after firing is real gold. Bronze and copper metal clays are available which are much less costly than gold and silver. You get more for your money, and they are beautiful metals when finished. They are useful if you do want to work in silver for testing out designs. Some producers of metal clays have introduced other metals such as steel and iron. All give you the real base metal once fired. Pre-mixed clays come in the clay form in a sealed packet. Once opened these clays tend to have a short working time as they dry out quite quickly. Unused clay needs to be stored wrapped tightly in a container or plastic (e.g. clingfilm) to ensure it doesn't dry out. If it does dry out it can be rehydrated but takes a little work. Powder clays, as the name suggest, come as a metal powder mixed with a binder, which requires mixing with water by the crafter. This has a few advantages over pre-mixed clays. You can obtain the consistency you need. You can use just the amount you need for your project and the unused powder will store well. The clay when made up also (in our experience) takes much longer to dry out in comparison to pre-mixed clays, so the working time is greater. There are a few different ways that can be used to dry the clay. They can simply be air dried. Some people like to use a cup warmer, or a food dehydrator can be used. The clay should be dried a slowly as is possible, as the clay can curl, warp or crack if dried too fast. Another way to help avoid this is to ensure the piece is dried with air circulating all around it. Whichever method is used items must be fully dried before firing as any moisture left will cause blistering defects. One of two methods tend to be employed for the firing of the clay. The first is using an open flame such as a gas hob or a handheld gas torch (the kind you might use to make creme brulee...). This method can be successfully used for silver and gold clay. This method is not so well suited to base metal clays. The second method is to use a kiln. Both precious metal and base metals clays can be kiln fired. In the case of base metal clays though it is the preferred method. Items are fired usually in a two-step process, covered with an activated carbon in the second step, to reduce the amount of oxygen present, as oxidisation occurs when the metals are heated. Some crafters have reported having success torch firing base metal clays, but the pieces need to be very small, and the method is not as reliable as kiln firing for these metals. Polishing metal clay can be a fun process, as it's wonderful to see the fired piece being transformed from it's dull fired look to a bright, beautiful metal. Polishing can be done with sandpapers, working from a coarse grit (e.g. 400) to a higher grit( e.g. 1200). Items are usually cleaned first using a brass wire brush. Sanding does take a little bit of elbow grease and time. A faster way is to use a handheld tool such as a Dremel, with silicon polishing wheels or radial discs (sandpaper can also be used by attaching it to a split mandrel). A tumbler with stainless steel shot can also be used, and some crafters prefer just to use that. In our experience the result depends on the metal and clay brand used. 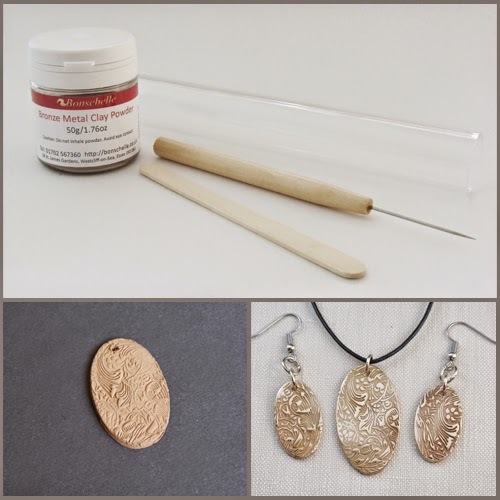 Metal Clay is a wonderful craft material, is very easy to learn to use, and can produce some beautiful results. The only limit is your own creativity! 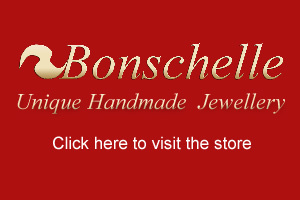 If you would like to try using metal clay Bonschelle offer a great starter kit which comes with clay, tools, and full instructions which include guided steps on making your first pendant and earrings (everything you need for this is included). If you don't have a kiln you can still venture into this craft as we offer a firing service (cheaper than buying a kiln!). For more details visit our Metal Clay page.